SLMWeek: Lead Management isn’t about implementing software. 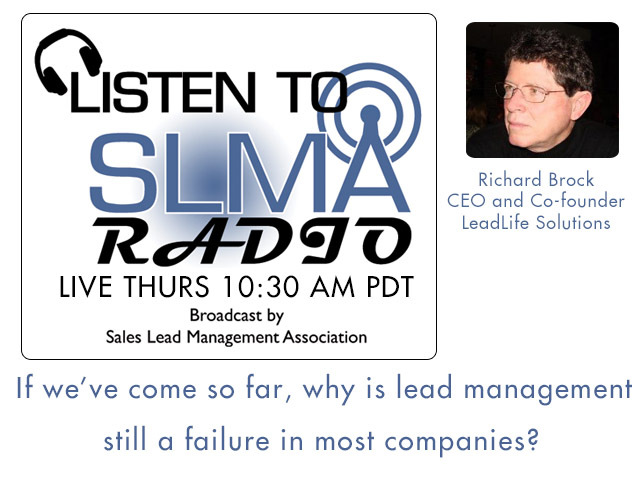 During this celebration of Sales Lead Management Week, we interviewed Richard Brock of Leadlife in 2014. It's still relevant, we still haven't learned. Richard Brock, who many say is the founder of customer relationship management and consequently modern sales lead management. We tackled the difficult subject of why lead management continues to be a failure at so many companies. Why do they think that by just putting in a software product they will instantly increase sales? Richard Brock is a tech-savvy, entrepreneurial software development professional with over 30 years of experience in CRM Solutions and deep roots in Marketing Automation. He is the co-founder and CEO of LeadLife Solutions, a provider of an on-demand lead management solution that drives revenue by bundling state-of-the art marketing automation technology with lead management systems to maximize sales opportunities. He is a board member of the Technology Executives Roundtable, mentor to various technology companies and Founding Father of CRM. Richard pioneered the Sales Force Automation space by starting Brock Control Systems (Firstwave Technologies), which became the leading provider of web-based Customer Relationship Management applications. Why is Lead Management a failure of so many? During our annual sales lead management week, we interview Richard Brock, who many say is the founder of customer relationship management and consequently modern sales lead management. During this interview, his third time on the show, we tackle the difficult subject of why lead management continues to be a failure at so many companies. Why do they think that by just putting in a software product they will instantly increase sales? Get ready for a thumping from Richard and Jim Obermayer the host. By the time you get an opportunity to speak with the prospect, they have all kinds of information and preconceived ideas about their needs and the solutions that can meet their needs. So, you need a way of seeing what they’ve done and aligning your conversation with theirs. Unlike other software, SalesTalk is part of a proven platform that interprets the seller’s conversations through a click or touch technology and is combined with the prospect’s digital behaviors, providing consistent execution of your company’s sales strategy. The story-so-far feature within SalesTalk allows you to do just that. SalesTalk’s story-so-far feature is unique because it delivers critical data by tracking the timing and flow of every interaction with a prospect – each and every digital and conversational behavior is logged complete with time spent. All information within the story-so-far is synchronized behind the scenes with a company’s CRM system.